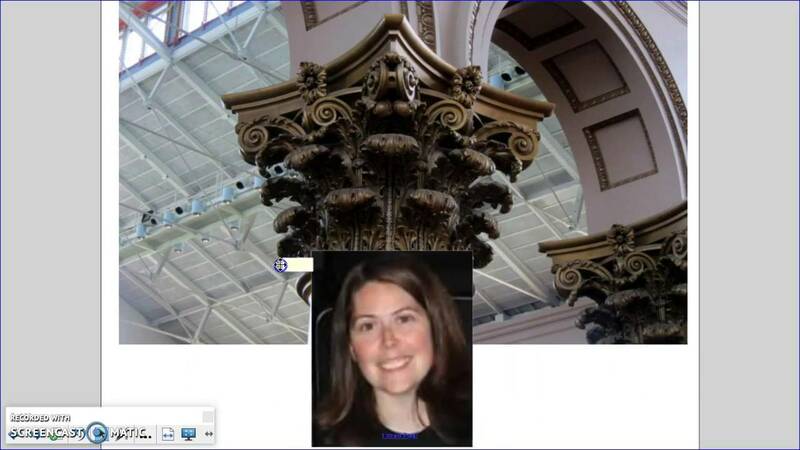 I can curate online content to support student learning (6.1). I can plan the scope and sequence of a blended lesson (6.2). I can support my reasons for using a blended lesson (6.3). I can reflect upon and revise my blended teaching practices (6.4). We begin by overviewing the role content curation plays in blended teaching. Figure 6.1 All of the pieces coming together. Teachers have long been perceived as guardians of knowledge. They stood guard at the vault door, protecting the knowledge that lay beyond it. Each day, students came to the vault to receive a bit of knowledge. The teachers opened the door enough to let a little bit of knowledge out, so that students could absorb a bit of what it had to offer. They soaked in this little bit of knowledge and information offered by their guardian teachers then returned again the next day to soak in a little more. While teachers are important curators of knowledge and are essential in making sure that knowledge is passed on to new generations, the guardians of knowledge approach presents students as passive students whose learning is dependent upon how wide their teachers wish to open the door to the vault of learning. 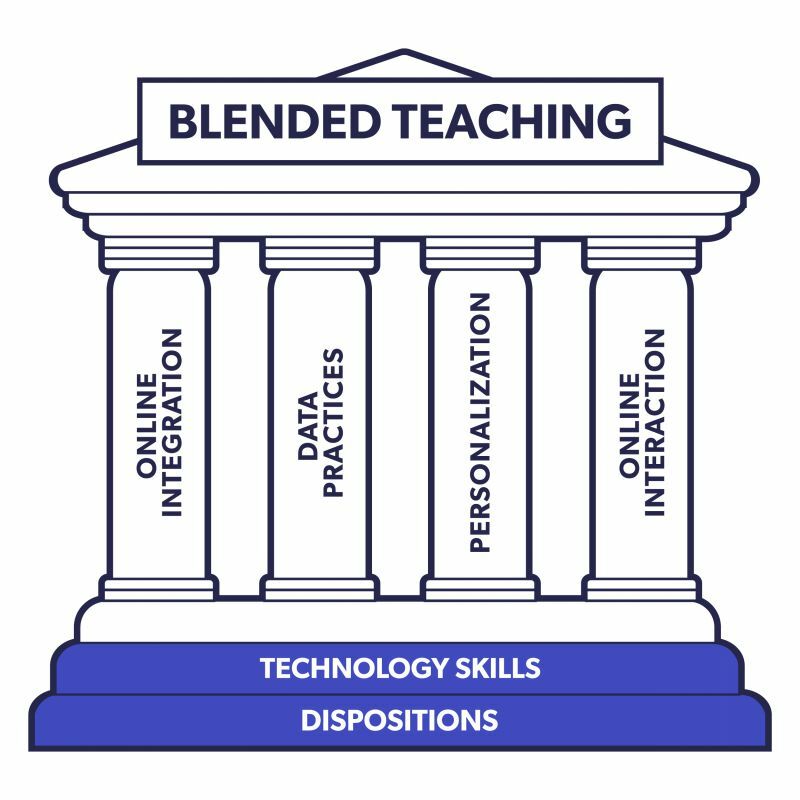 Blended teaching presents a better system. Plutarch said “the mind is not a vessel to be filled, but a fire to be kindled” 1 and the blended teacher personifies this mantra. Your role as a teacher in a blended learning classroom is to give students the key to the vault, so they can take as much or as little knowledge from it as they want (while always pushing students to take a little more). Throughout the previous chapters, we have discussed using the online space to house learning activities, assessments, data, learner profile information, and opportunities for interaction; however, we have not fully discussed how the online space can also be a place to create a virtual vault of knowledge that students can freely access. This section introduces how to curate content for your students using the online space. It can be somewhat overwhelming when you think about all of the different types of content that instructors can use in their courses. We have created a framework to help simplify the landscape. The graph below (Figure 6.2) plots types of content based on two variables: richness and responsiveness. Richness—varies according to the number of senses that students use when interacting with the content. Low: Text such as books or online readings. Medium: Audio recordings such as podcasts. High: Multimedia presentations such as video that contain visual and auditory elements. 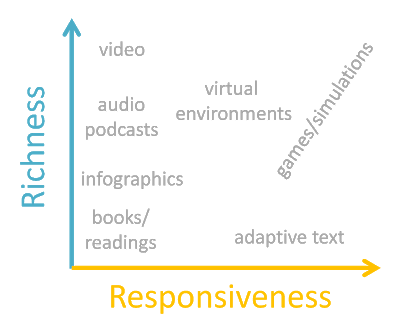 Responsiveness—varies according to the content's ability to adapt to student needs and actions. Low: Text and video allow students to learn at their own pace but are static, and the actual message doesn’t change based on the students’ behavior or needs. Medium: Some types of content may not automatically adapt to students, but it can provide students with a lot of choice and exploration opportunities. For instance, online environments such as virtual chemistry labs2 allow students to experiment in ways that would be too dangerous in real life. Similarly, desktop observatories such as Stellarium3, or virtual worlds such as Google Earth4, allow users to see and explore areas that would be difficult or impossible to do in-person. High: Some types of content will actually recognize students’ level of understanding or ability and change what is presented to the student based on students’ needs. For instance, adaptive learning software continually assesses students and allows students many opportunities to practice skills with less and less support until they reach mastery and move forward to more difficult concepts. Similarly, educational games are highly responsive by providing a student with the ability to make choices and then instantly adapts according to the student's action. Figure 6.2 Richness and responsiveness of content. Please note that this graph is not measuring value. In other words, text (low levels of richness and responsiveness) is not less valuable to student learning than a simulation (high levels of richness and responsiveness). Each type of content has its own affordances and is valuable for different reasons. At the risk of being overly simplistic, static content is usually used to absorb and think deeply about information and dynamic content is used to apply, practice, and demonstrate. Because there are many different types of learning objectives, it’s best for you to integrate several different types of content. There is an enormous amount of content already made specifically for you as a teacher to use. Many vendors sell content directly to school districts—often at a high price. Others focus on selling affordable materials directly to teachers, including Teachers Pay Teachers5 which allows teachers to sell materials to other teachers. There are also lots of materials that are free to use. However, when using materials that you find online you need to make sure to protect student data and follow copyright law and fair use guidelines. Do students have to make an account in order to start using that app? If so, did students have to provide personal information (email, name, age, etc.)? Who has access to students’ email and other information once they’ve created that account? Does the app require parental permission? Does the app developer share student information with others? Does the app collect additional information such as location or contacts? Does the app have an age requirement? You may wish to check with your school or district administration regarding approval for classroom use. The media that are being used were not created specifically to sell to schools/students. You are not negatively impacting the commercial value of the work. The media are being used for an educational purpose. The media were legally acquired. The copyright holder is cited properly. Entire images can be used but you should only use five works per artist and 10% or 15 images from one published work, whichever is less. Fair use guidelines apply in any educational setting but online teachers also need to follow the guidelines in the TEACH (Technology Education and Copyright Harmonization) Act8. Basically, the TEACH Act says that the teacher should take precautions to ensure they are only distributing materials to students in their class. This is one reason why educators are encouraged to use password protected learning management systems (LMS) such as Blackboard or Canvas. Creative Commons9 is a growing movement that allows creators to easily remove some or all of the constraints that copyright and fair use guidelines have placed on others wanting to reuse, redistribute, revise, or remix their work. In a TEDxNYED presentation, Dr. David Wiley argued that the open movement "is really about sharing, about being generous with other people, and about giving. . . . and overcoming the inner two-year old in you that screams, 'Mine! Mine! Mine! '"10 Whatever people's motivation for sharing their work, it's important that you are aware of what Creative Commons licenses are so that you can benefit from it and possibly contribute yourself. Not all Creative Commons licenses are the same and some are more restrictive than others so it's important to know what the different symbols mean. On a side note, this book is licensed under Creative Commons Attribution Share Alike (CC BY SA) license. This means that people like you can share it by copying and redistributing it and adapt it by remixing or revising it to suit your needs. You could even use this book to create your own book, professional development seminar, conference presentation, or lectures series so long as you provide attribution to this work and its authors, and also license your new work using a CC BY SA license. https://edtechbooks.org/-Dp allows you to easily search for creative commons material. https://edtechbooks.org/-qi provides you with information on the different types of licenses. https://edtechbooks.org/-iP allows you to create a Creative Commons license to include as part of the materials that you create. 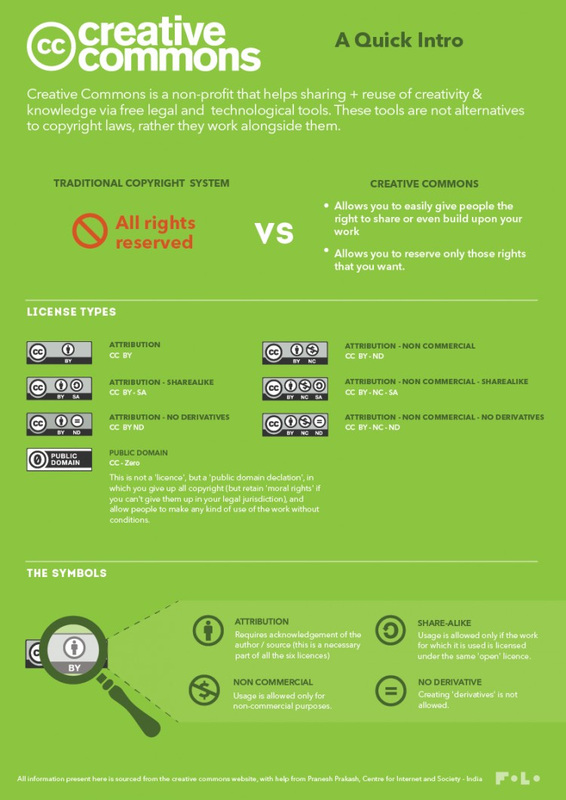 The following infographic (Figure 6.3) provides additional information on the concept of Creative Commons and the different licenses that are available. Figure 6.3 Creative Commons Licenses. Teachers have always created learning materials, and blended teachers are no different. Creating online content can seem intimidating, but it has actually become very doable and is a practical solution if you want more customized content for your students. Every day it seems that there are new tools available for creating content. Because the companies that create these tools want teachers to use their materials, they have made their tools as intuitive as possible and commonly provide helpful tutorials for those who need a little extra help. What’s difficult is creating online content well. In this section, rather than focus on specific tools for creating online content, we will focus on some guiding principles for creating quality online content. While we are focusing on teachers creating content, all of the examples shared in this section could also be used by your students as a way for them to demonstrate their understanding and skills authentically. There are three common types of videos that teachers create: edited, screencast, and animated videos. Screencast Videos: Screencasting software allows you to record whatever is seen on your screen with accompanying voice narration. You might use screencasting tools to create video lectures so that students can see presentation slides while listening to your lecture. Additionally, you might use screencasting tools to provide video tutorials or demonstrations of software you want students to learn how to use. At times, these videos will also include a small webcam recording window in the corner of the screen so that the students can actually see the teacher while she is talking to them. Tablets can also allow you to include handwriting and drawings while you talk. In fact, Khan Academy (https://www.khanacademy.org/) is built on these simple screencasts (for an example video, see https://youtu.be/uzkc-qNVoOk). Edited videos: Edited videos can include video, images, titles, transitions, and music that help grab students’ attention. These added features also make creating edited videos much more time consuming than creating screencasting videos. Edited videos are best when they show students places and events that would be difficult to see in the classroom. Animated Videos: Typically creating animated videos requires a lot of time and talent. However, there are now tools that allow you to quickly create animated videos even if you struggle drawing stick figures. Animated video editing tools commonly have a free account for teachers. However, carefully review the limitations to the free account because if teachers or students exceed length limitations or use premium animations they will be unable to render their video without upgrading to a paid account. Powtoon (https://www.powtoon.com/) is perhaps the most popular animated video editor. However, it is also has one of the most restrictive free accounts. Moovly (https://www.moovly.com/) is another option that doesn’t have the same length restrictions on their free account—for now. Video 6.1 was created using Powtoon and provides an example of what an animated video can look like while sharing examples for how it could be used in the classroom. 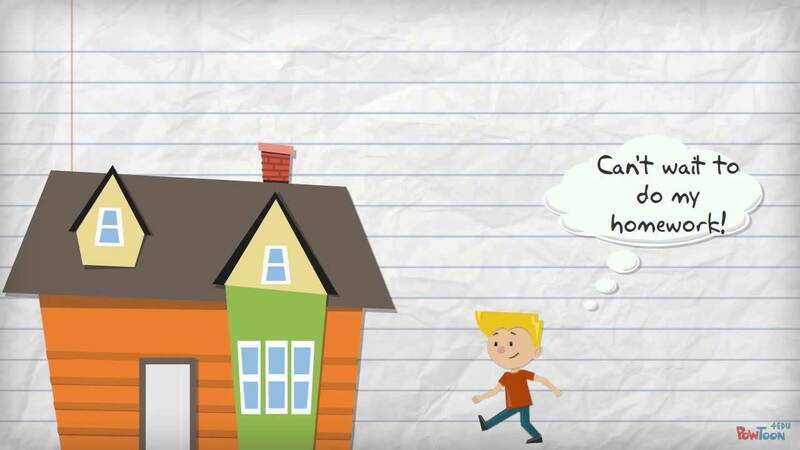 What to Look For: Notice how you could use animated videos in your own classroom. Watch the video examples (6.2 and 6.3) provided on the next page to see the difference between screencast and edited videos. The screencast video records a PowerPoint presentation and the accompanying teacher lecture. While there are many boring video lectures, this one is actually pretty interesting because the slides are visual, and the teacher used custom animation and humor. The same teacher also created an edited video teaching the same material. 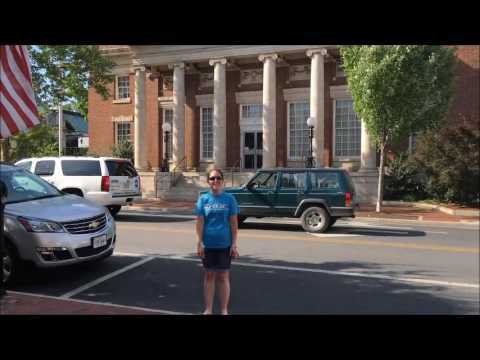 Rather than recreating a lecture that she could have given in class, she took students out into the community to show them examples. Notice that she also carefully chooses background music and title fonts that matched the subject. What to Look For: Look for benefits and downsides of teaching with a screencast video. What to Look For: Notice the benefits and downsides of teaching with an edited video. Videos are best when they are shorter than 6 minutes. Videos that combine video of the instructor with PowerPoint slides are more engaging than videos with only narrated PowerPoint slides. Narrated screen recordings that show the instructor writing and drawing are more engaging than those that show static PowerPoint slides. Videos are more engaging when instructors speak quickly and with enthusiasm. Videos are more engaging when they show the instructor in personal settings. Chunk content. It can intimidating for students to see a long content page so it's better to chunk the content onto separate pages. Use bullet points when presenting lists or steps. Use bolding strategically to draw attention to important terms or phrases. You should also avoid using blue text because students may confuse it with a hyperlink. Shorten the line length. When text is too long, it takes longer to read because your eye has to cover more ground going from the left of the screen to the right. This is why newspapers use columns. However, online pages don't use columns. Instead, you can shorten the line length by creating tables with text in one column and images or videos in the other column. Left-justify text. When text is centered it can make it difficult for students to read because it's a little harder to find the line where the sentence continues. As a result, it's much better to left-justify all paragraph text. Use images, symbols, and icons purposefully. Images can be a powerful teaching tool that engages students. However, not all pages need to have an image and too many images can be distracting—especially when they're not closely related to the content. Icons and symbols can also be repeated to signify certain tasks/activities. Embed videos. Rather than linking out to videos, embed them directly into the page unless viewing the video is optional. Embrace headings and white space. Try to break up long paragraphs into shorter ones. Headings can also help cue students to topics. White space between topics can also help to break up the information. Avoid small text. Text should be at least 12-point type and larger if you have younger students. Use intuitive navigation. Ensure that there is a sense of flow in your course navigation. You don't want students to feel lost in your course. You also don't want them not knowing what to do next. Starting each page with an introduction and ending with a description of and link to what’s next can be helpful. We need to ensure that our courses do not discriminate against students with disabilities. As a result, it is your responsibility to ensure that the educational materials and activities in your course are accessible to all students. Although school districts would never construct a building without proper accommodations for those who use wheelchairs or who are blind, many online materials are not accessible to students with disabilities. Although we need to make all aspects of our courses accessible, we wanted to take a moment to talk specifically about videos. Videos can be the most time-consuming thing to make accessible because we need to add captions for our students who may have difficulty hearing or who are learning English. Thankfully YouTube has made it much easier to do just that. When you upload a video, YouTube will use voice recognition technology to automatically add captions to your video (sometimes it takes a couple days). While YouTube captioning can be pretty bad at times12, they have gotten much better the last couple of years. However, they are not perfect and should only be used as a starting point. We were curious how long it would take to make corrections to the automatic captions on one of our videos, so we tested it out. The video was 5 minutes and 39 seconds long and it took us about 10 minutes to caption it correctly. For longer videos, services such as Rev.com can provide captions for about $1 per minute of video. Learning standards and goals: Learning standards are established by the state or national entities and provide the big picture of what students will be able to know and do at the end of the unit or course. However, when designing smaller activities, it’s a good idea to break down a learning standard into smaller goals that can be accomplished during a single activity. Learning goals typically start with the phrase “At the end of this activity, students will be able to…” (sometimes called SWBAT for short). The learning goals are the vehicle that drives the course assessments/activities and content. Assessments: Procedures used to measure students' knowledge and ability and determine if students have met the learning goals and standards. These can include traditional (e.g., text, quizzes, essays) performance (e.g., student projects, demonstrations), formative, and summative assessments. Activities: Learning activities help prepare students for assessments and aren’t typically graded, or students are awarded points largely based on participation. Examples include listening to a lecture, reading a book, or participating in a discussion. It’s important that your learning goals, assessments, and activities are aligned as seen in Figure 6.4. 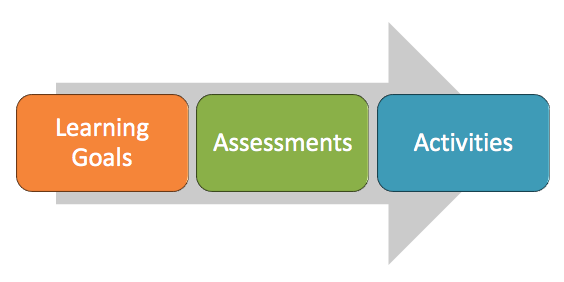 Figure 6.4 Aligning learning goals, assessments, and activities. We recommend planning your lessons using a table that aligns each of the three elements. Tables (like the one in Web Resource 6.1 below) also allow you to easily recognize patterns in your unit design. This Google Doc is an example of a sheet you may want to use to align the three elements of a unit—objectives, assessments, and activities. Once you’ve developed an overall unit alignment, you can start planning the lesson sequence, or the ways that the learning activities will be organized for students. For instance, an online discussion could occur before, between, or after in-person activities. Discussions could also start in-person and then move online or vice versa. It’s also good to remember that blended learning can be more flexible in the learning structure than traditional instructional units. The nature of blended learning gives students some flexibility in how and when they participate in learning activities. Teachers should also plan on using data frequently to adjust learning sequence to meet student needs—both individually and collectively. There is no “wrong” sequence and how you decide to order activities can depend largely on your goals for the blend (remember the 7Ps & 4Cs from Chapter 1) and the dimension you have chosen for personalization (see Chapter 4). When you began planning your blended lesson, you should have chosen some reasons for blending. The reasons should have included improving student outcomes and may also have included increasing flexibility for students or decreasing costs of lesson materials. We hope you included at least one of the seven P’s, or one of the 4 Cs identified in Chapter 1 in your rationale. Once you began developing your blend, however, these reasons may have changed. You might have originally decided to blend to allow students to have increased participation in class. However, once you chose your blended teaching model and standard, and began to develop assessments and activities using them, you might have shifted away from your focus on participation to a focus on allowing students to come to class prepared, so they can have more time for classroom-based activities. As experienced instructional designers, we understand that plans for designs often change or evolve during the development process. Because the reasons for a design can change during development, it is important to revisit the goals you had for students when you began planning your blend. If the goals remained the same, you should check to make sure you are meeting those goals. If the goals have changed, you should check to make sure that your new goals are still student focused. It is okay to shift from focusing on allowing students to receive practice with feedback (one of the seven P’s) to a focus on collaboration (one of the four C’s). However, it is unproductive to shift from a goal that’s focused on increasing student learning outcomes or engagement to a goal of increased convenience for you. Convenience is not one of the four C’s! Blending might make presenting and teaching content more convenient, but it should not be the reason that fuels your blend. Once you understand the goals for your blended lesson, you should make sure that the way in which you have sequenced your lesson meets these goals. If an administrator, parent, or other teacher comes to you and asks you why you have chosen to blend your lesson, you should be able to readily explain how it is increasing opportunities for your students. Reviewing the seven P’s and four C’s from Chapter 1 and the PICRAT matrix from Chapter 2 will help you to explain how your blended lesson attempts to increase student opportunities and engagement. You should be able to map each part of your blended lesson to one of your reasons for blending. The following is an example of how your sequence of activities can be supported using your goals for blending and the PIC-RAT matrix. Bolded words refer to PIC-RAT, the seven P’s, or four C’s. This lesson rationale is for a third-grade math standard focused on estimating and measuring liquid volume. The lesson takes place over a one-week span of time using 45 to 60 minutes per day and relies on a lab rotation model. In addition to using my LMS to organize this unit, some of the learning activities also happen through the learning module. For example, the lessons for Monday and Tuesday both have videos that explain concepts essential to the objective. Because these videos are mostly passive (they do ask students to answer some questions, making them a little interactive), we have supported the videos with interactive games. These games help students better understand the essential concepts behind using graduated cylinders and liquid volume measurements. I am also using a discussion board on Tuesday and Thursday to allow students to interact with each other’s ideas. This increases students’ participation in class discussions. We do not have enough time in class to allow everyone time to share, and some of the more introverted kids rarely share anyway. The discussion board gives everyone the opportunity to share their ideas and have people respond to them. This practice amplifies students’ opportunities to share their ideas with others. The discussion is book-ended with in-person class time that introduces and concludes the discussion. Lastly, the lab assignment is provided through the LMS so students can collaborate, and work at their own pace to understand the water displacement method. While students are working at their own paces, I rotate around the room to help those who need more instruction. This practice increases personal interaction, allowing me to provide each student with the help he or she needs. For students who finish their work more quickly than others, I have included a bonus problem to work on within the module. The bonus problem reinforces ideas from the lab and helps personalize pace by providing students with additional instructional activities. 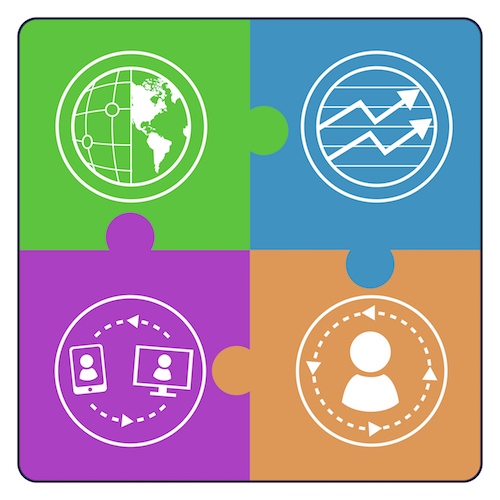 Create learning profiles for personalized learning goals. Small implementation goals will help you to become familiar with the concepts shared in this book and increase your confidence to take on an entire blended unit. Which activities worked? Which didn’t? What assessments helped? How did you use data? Do you need to increase or decrease the level of student agency (personalization)? Did the online interaction go as planned? Were the prompts divergent and rubrics helpful? By reflecting on your practice using learning data, observations, and student evaluation comments, you will be able to revise for the next iteration of the blended lesson. This is an iterative process. It’s not realistic that you will master blended teaching the first time you try it. At times we hear teachers say something similar to, “I tried blended teaching once, and it doesn’t work.” That’s similar to a teacher saying, “I tried face-to-face teaching, and it doesn’t work.” It’s likely that lessons will not go as well as you hoped the first time, but that doesn’t mean that the format itself doesn’t “work.” In fact, when teachers and students try something significantly different, it’s common for their performance to drop temporarily before they master the new ways of teaching/learning; however, performance then recovers and even surpasses the previous performance. 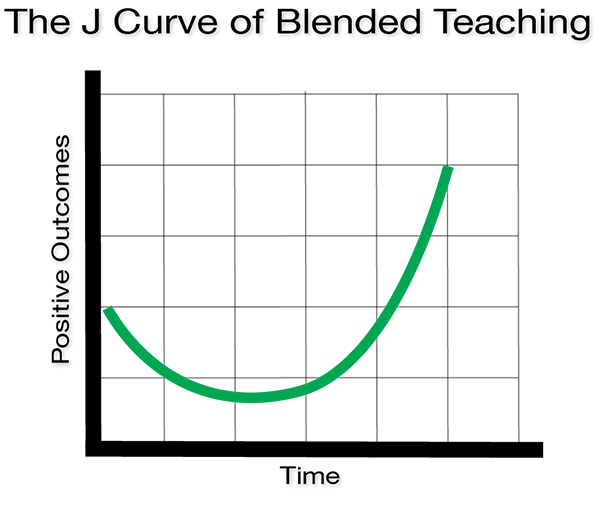 This phenomenon is called the “J curve” as shown in Figure 6.5. Implementing blended teaching practices for the first time will be challenging. We hope that the resources and strategies in this book will help you along your journey. We are confident that you and your students will be successful if you are thoughtful, intentional, and persistent.